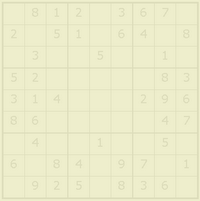 Daily free Sudoku puzzles to play online or print. The daily sudoku puzzles has difficulties between medium and hard, sometimes easier, sometimes harder. By the way, feel free to integrate this Sudoku of the Day in your homepage or blog. Just copy following lines to the desired place, and you will get our new sudoku puzzles day by day.